Yoga has been the greatest gift in my life over the past few years – it has not only helped me to feel physically strong and healthy, but mentally empowered. It has taught me great self-awareness, as well as respect and kindness towards others. After religiously practicing yoga for a year, I decided to dedicate a month to complete my 200 hour Vinyasa teacher training course. I was yearning to share my passion for yoga with others and have the ability to showcase the life-changing benefits that it has to offer. 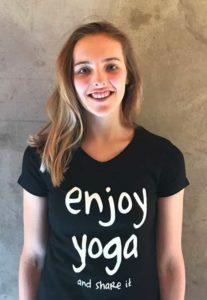 Being involved in Ahim’SA has allowed me to share this passion and the beauty of yoga with those who may not have had access to the practice before. I believe that all people should be given the opportunity to practice yoga, despite one’s circumstances.